Fall is upon us, and that means comfort food season is here. It's time to bust out the chili, sauerkraut and pork, lasagna, bean and ham soup, chicken and dumplings and, of course, beef stew. There are certainly many, many other fall and winter comfort foods, but those jump immediately to mind. I call this "fairly simple" because it falls in between brain-dead, dump-it-in-the-crockpot easy and ugh-that-is-too-much-work difficult. You'll see that I use some canned goods to minimize the fuss without compromising flavor. You have to do some prep, but the result is more than worth it. I served mine with some simple garlic cheddar biscuits for soppin'. I'll have to post that recipe soon. 3 stalks Celery, sliced to 1/4"
2 lg Russet potatoes, peeled and cubed to 3/4"
Note: I use Campbell's soups. Trim all the excess fat from the beef and cut into 1" cubes. Season the beef with the garlic salt and coat with 2 tablespoons flour. Heat the canola oil in a large heavy saute pan over medium-high heat. Add the beef to the pan and quickly brown on all sides. Note: If necessary, brown the beef in batches to avoid over-crowding the pan. 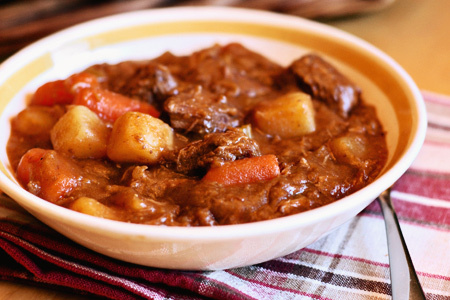 While the beef is browning, preheat your slow cooker to high heat. Add all three soups, garlic, pepper, bay leaves, and the Worcestershire to the slow cooker. Add the browned beef to the slow cooker and deglaze the pan with 2 1/2 cups water. Add the deglazing water to the slow cooker, cover, and cook two hours on high. Add the celery, carrots and potatoes to the slow cooker and stir to combine. Cook another two hours on high. Combine 2 tablespoons flour and 1/4 cup water in a small bowl and whisk with a fork until it forms a smooth slurry. Add the flour and water slurry to the slow cooker, stir well, and cook another 45 minutes, stirring occasionally.